Among the most beautiful Kshetrasamkalpas (imagination about the temple) in the world is the concept of Ayyappa and the 18 steps. It is believed that the 18 steps and the forest area called the Pumkavanam (the forest garden) are the gift of the almighty God. Sabarimala, which is surrounded by 18 great mountains, having thick forests in the sides and valleys in the midst of these forests, the divine steps and after the 18 steps the idol of the illuminated one like a folklore. It is abstract that there should be a hidden truth. In the story of spirituality the 18 steps has some importance. In the Hindu Dharma there is a samkalpa of one, zero, eight. This is 108, has a great spiritual effect. The one is the paramatma the zero is the maya and the eight is the eight formed natural jivatma. This is represented by a necklace having 108 pearls, 108 names of god, a totality of 4 vedas, 20 smrutis, 18 puranas, 64 Tantrasastras, two epics and so on. There are 18 chapters in the Mahabharata and also in the Gita. If the zero in the middle of the 108 is removed the 1 and the 8 come close together. That reveals, if the zero – maya is removed from between the 8, the jivatma and the 1, the paramatma, they can easily rejoin together. Therefore we can understand that 18 is the number for realization of God. The 18 epics also reveal the reality. 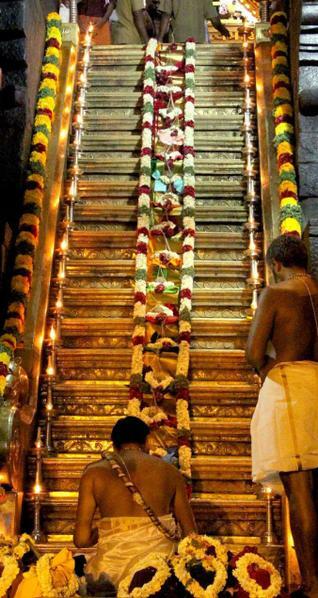 The 18 mountains around the Sabarimala and the 18 steps to reach the abode of Ayyappa also reveal the reality. the Lord Siva, According to the Tantricsm and Yogaic sciences, within the backbone of a human being there is a nadi (a pulsative vein) called sushumna. 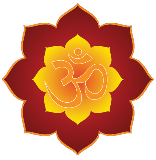 There are six chakras (circles or points) related to sushumna from its bottom as Muladhara. Swadhisthana, Manipuraka, Anahata, Visuddhi and Ajna. At the far end of the top of these cakras there is a seventh one called Sahasrara over the head. 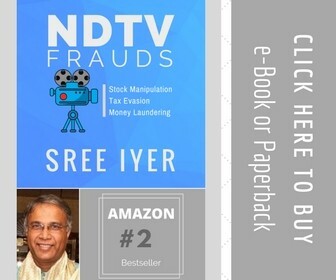 If we analyse some more deep and we will understand that there is a variant and secret bodily principle in the tantricism which is arising revealed, in the principles of 18 steps at Sabarimala. There is a small cakra or upacakra viz. Lambika between Visuddhi and Anahata. From the Ajna Cakra, in the middle of the forehead, go ahead measuring a width of a finger each, the 12th point is the centre of the head, the pate is the Sahasrara (please see the picture). Therefore the 7th cakra, the sahasrara, according to the Tantricism, is called Dwadasantyam (the end at the 12th). At the far end of the six cakras and the 12 points, the abode of the paramatma is revealed. This secret of Yogasastra is concealed by the 18 steps (12+6) in front of the Dharmasasta. The secret of science of spirituality is once more elucidated hereafter. 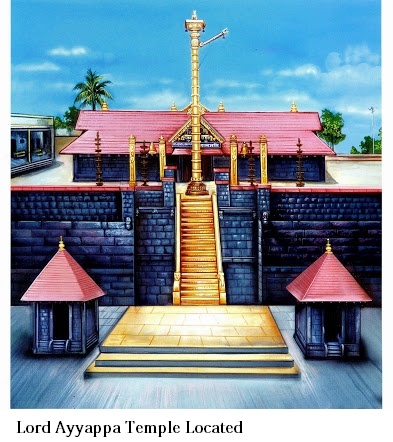 The Sabarimala may be considered as a backbone, the footpath to the temple as sushumna, the first truppat, it is the Muladhara, the second the Swadhisthana, the third the Manipuraka, the fourth the Anahata, the fifth the Lambika, the sixth Visuddhi and the seventh is Ajna. From the eight to the twelth are bindu, Ardhacandra, Rodhini, Nada, Nadanta, Sakti, Vyapika, Samana, Ummana, Mahabindu and Sahasrara are respectively. At where the total 18 steps end at the same place remains the abode of the Paramatma. The jivatma passes through the pancendriyas (the five sensual organs), the ten pranas (five vayus and five pranas) The three Antakaranas (the three consciences) (5+10+3=18) and reaches the sublimest god, the reality. This principle of the Ashtangayoga is also seen here. The state of Turya pertaining to Sri Ayyappa is also seen here because he is in the Dhyanarupa. Another imagination may further be sought out like the following. The five kosas related to body viz. Annamaya, Pranamaya, Manomaya, Vijnanamaya and Anandamaya and the five states of the body viz, Asti, Jayate, Vardhate, Vipascyate, Jiryate and martyate and the seven dhatus like Rasam, Raktom, Mamsom, Medas, Asti, Majjah and Suklom. All these 18 factors philosophically related to the body symbolizes on the 18 steps at Sabarimala. The 18 steps may also represent the 14 words from Patalam to Satyalokam and the 4 other words like Antariksha, the Akasa, and the Andhakara (hell), the jyotirmaya (enlighted); totally 18 words. A jivatma which goes beyond these 18 words is symbolized here as passing over the 18 steps. These holy steps represent not only all the 18 puranas but also 4 vedas, 6 vedangas (upavedas), 6 Darsanas (Schools of Philosophies) and two epics. It may also be explicated that they represent all the 18 smrutis and 18 important Tantric schools. 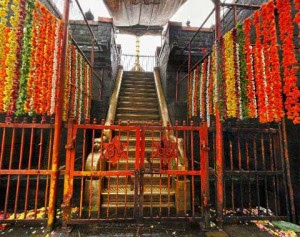 The next idea cannot be repudiated because it is more relevant in this connection that Lord Ayyappa had already wanted to the king that there should be 18 sopanas (steps in this context) in front of the shrine, at the time of constructing the temple. This story has been written in the book of Sribhutanathopakhyanam. According to that book the 18 steps represent Pancendriyas (5) Astaragas (8), Trigunas (3), and Vidya and Avidya (2). Astaraga – kama, krodha, lobha, moha, mada, matsarya, dumbha, assuya. Avidya – All the desirous tendencies. It is once more declared that if a jivatma has to reach the Brahmam he has to overcome these 18 steps.